With the refugees crisis and poverty, one in seven kids in world do not have enough food to live an active life. To help a hungry child, the World Food Programme has made it easier than ever before to give. 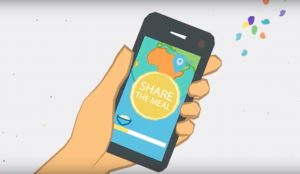 With a tap on your smartphone you can “share the meal” with a child in need. It costs only US $ 0.50 to feed one child for a day. You do need either a paypal account or credit card saved in the app to process the payment. The United Nations World Food Programme provides the meals. They show the progress and where meals are distributed. So far there have been nearly 3.5 million shared meals. Smart phone users out number hungry children 20:1. Imagine the incredible difference you and your friends can make.